I just ordered a VCI-100 Arcade, what colors do you think would be good on it? I'm thinking yellow knobs and blue buttons. Sadly no midifighter yet... Waiting on that too... Well, OP Delivars. My second choice would have been Blue buttons and yellow knobs... I'd give that a shot, if not feel free to try my colors out. 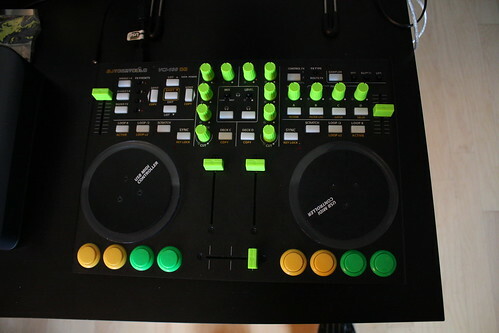 The idea is that the green knobs/faders are a shade between the yellow and green on the buttons. If you keep a color theme instead of doing color opposites it still looks cool but a bit more professional... Crazy colors will tend to look more like a toy (which for $850 I wouldn't mind it looking like a toy). ALSO! Note that the text on it is NOT blue like some of the photos, it is NOT gold like it would seem in some of the others, but instead it is YELLOW! Which just worked out great as an accent to the buttons. Last edited by tyfurious; 06-22-2010 at 05:39 PM. 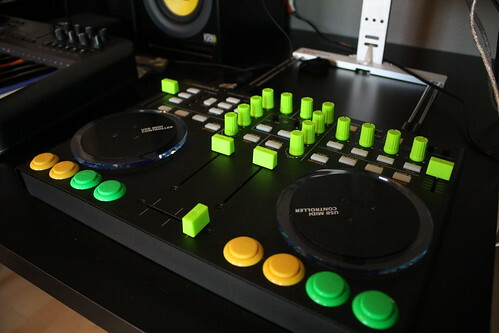 The green knobs glow in the dark right? 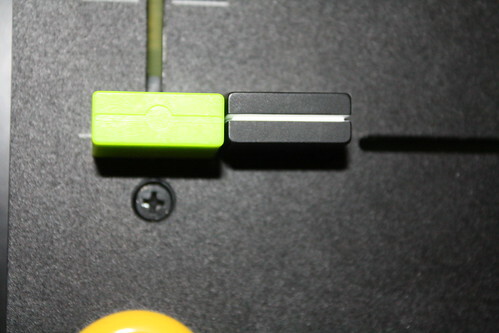 does the cross fader being green its a lot thicker then the black knobs. Does it fell good while scratching or its a bit too thick? I personally don't scratch a whole lot, and when I do it's to chill music... So, I guess I'm not that picky... I would say it's fine, although if you scratch a lot and you're picky then I would go with the rubberized (throw in some red buttons and it would look sick). They're not that much thicker, it's more of the feel and also that the green knobs don't have a really fine line on them (it's just an indent). For the kind of scratching you would do on a VCI I would say its fine (as the width and height changes are minimal and they don't feel that different. The knobs do have a noticeably different feel, although it isn't bad).